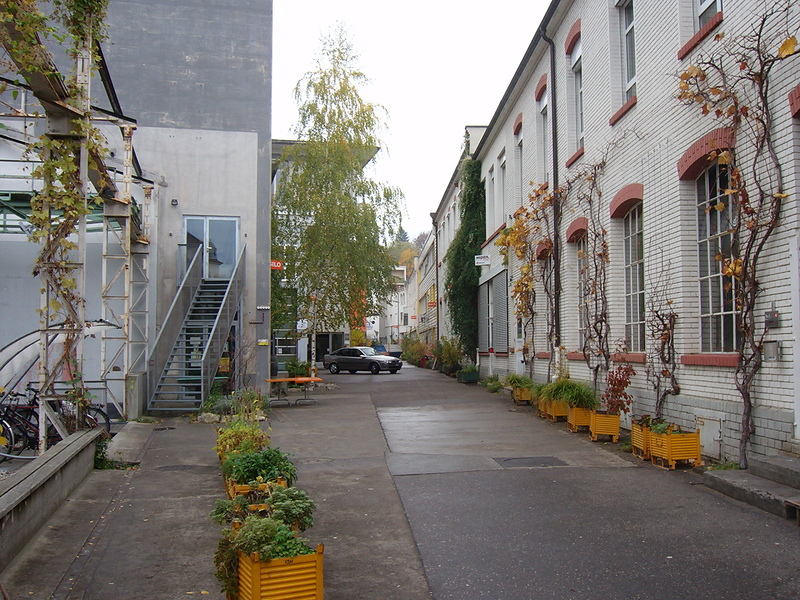 Today, I’ll take you to Basel, at Dornacherstrasse 192,where an old factory has been transformed into a neighborhood center, Gundeldinger Feld. The history of this place could be the same as many other places around the world: a 19th century factory in the inner city suddenly moving to the suburbs in order to look for more space, an urban void opening up in the neighborhood, maybe some developer buying the buildings in order to turn them into expensive lofts… But here the story takes a different path. The architectural firm INSITU, composed mainly of people living in the area, develops a project willing to promote local, indipendent business and improve the cultural offer of the neighborhood. They submit their proposal to the factory’s administrators: a Limited Company, composed of the architects themself will buy the buildings, renew and rent them to the different businesses. possibility, for a large and diverse population, to come and enjoy the area. The central alley. The restaurant Eo Ipso on the left, offices on the right. Details of the central alley. Here, all the works have been a new pavement for the alley, some flower pots and some bike racks. Thanks to laws in Basel encouraging car-free projects, no parking space is provided within the area. Flower pots are not fixed. Customers can move pots as they like, and give their own touch to the alley. Blinde Kuh restaurant, and its Braille-labeled bottles. In this restaurant, all waiters are blind, and people eat in complete darkness. Definitely worth trying! A hall waiting to be renewed. 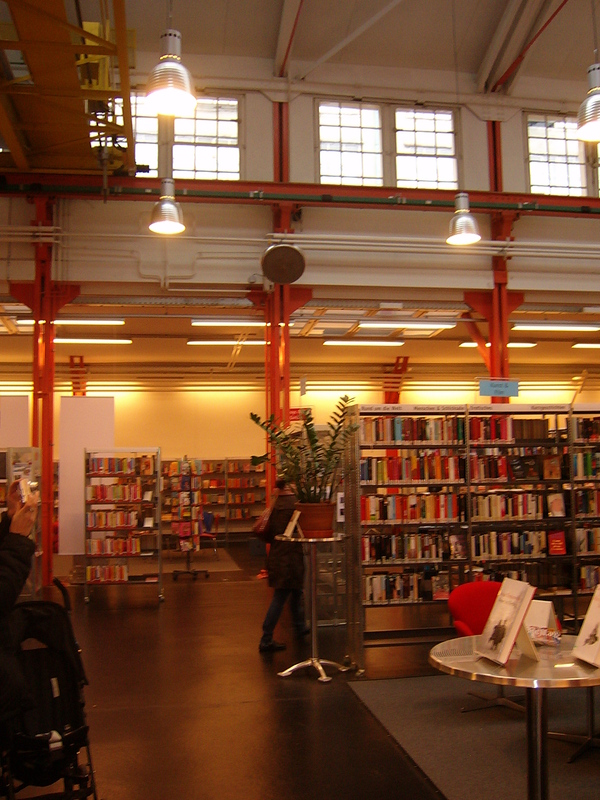 Another hall, turned into a public library. Lots of the factory equipement (cranes) are still on place. The Rock-climbing training hall. Here too, cranes and other industrial equipements are still visible. In order to be accepted from the main audience, sustainable development has to be fun: somebody will adopt it because of their environmental committment, some others just because it’s fun or convenient. And all together, all these people will make the business thrive. Small business need small rents, but not too small rents. Too expensive rents will make the area accessible only to the most luxurious brands, while too cheap rents will let small business survive without caring too much of their customers. And projects like this need business who take care of their customers! Did you like this place? Vote for it on Cooltownplaces.com! Précédent Votre ville est-elle cyclophile?